HAWAII, Kauai with Kids – If this will be your first trip to Kauai, or your first time visiting Kauai with kids, it may be hard to know where to draw the line between seeing all there is to see on the island and simply kicking back to make sure your vacation feels like a vacation–for everyone involved. Can you see why Tunnels Beach should top your list for “Kauai with Kids”? If the Kauai of your imagination includes crystal clear waters, foot-soft-sand, and a backdrop of green velvet jagging against Hawaiian skies, pack up your family and beach gear for a day at Tunnels Beach on Kauai’s North Shore (aka Ha’ena State Park). While the wave action nearest the parking lot is popular with accomplished surfers, the beach extending east from here follows a sheltering reef, creating a gentle shore break thick with tropical fish for about 2 miles. Though you’ll have to carry your provisions with you (small ice chest, sun umbrella, and snorkel gear to make the most of your visit as there is little shade and no guarantee that the food truck will be ), this is arguably one of Kauai’s most beautiful beaches, not to mention one of its best locations for snorkeling with kids. 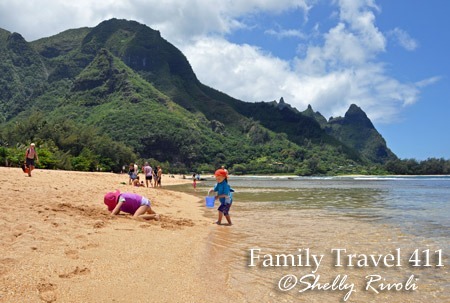 For more tips on planning your family’s day trip to Tunnels Beach, see my post on Kauai’s Best North Shore Beaches for Kids. Just one small section of the sprawling Kalamani Playground at Lydgate Park in Kauai. One parking space, two great family activities, and only 10 minutes from Lihue Airport in case you are looking for a convenient place to pass the time until you can check in to your accommodations (more in my post Kauai’s Best Playground–and Off-airport Waiting Area for Families). The sprawling, mostly wooden Kalamani Playground offers outlets for kids of all ages, from baby swings and toddler ride-ons up to a two-story volcano slide. Just across the parking area, you’ll find Lydgate Beach with its kid-friendly sheltered swimming lagoon, showers, and restrooms. A quiet morning at Salt Pond Park on Kauai’s south side. Since your time of arrival may have everything to do with how much enjoyment you get from your visit to Salt Pond Park, I recommend checking the tide charts in advance of your visit to see which mornings may have the most manageable low-tide times during your vacation (see Kauai’s upcoming tide levels here). This beach on Kauai’s south side is very popular with local families on weekends and after work hours. Yet it is not on the main tourist track for most families visiting this island. Even a Sunday morning found us on this nearly deserted beach–save for one sleeping camper and one sleeping monk seal we spotted on the sand. With the tide slowly coming in, we explored the temporarily exposed world of coral shrimp, anemone, sea cucumbers, and tropical fish in the pockets of the rocky outcropping that blocked any waves. Gradually, small waterfalls began to trickle over the rocks (as shown in lead photo), and a sheltered saltwater swimming pool filled in where the kids swam with ease. What a beach to have yourselves on a quiet morning in Kauai! See more photos and read all about our visit to Kauai’s Salt Pond Park in this post. Tour the Kilohana Plantation in a historic passenger rail car. Round out your visit to Hawaii’s “Garden Isle” with a visit to the historic Kilohana Plantation, where more than 50 varieties of fruits and vegetables are still grown today. Whether you opt for the popular narrated 40-minute Kauai Plantation Railway tour, with a pit stop to feed the farm animals–the definite highlight for young kids (bread is provided); or opt for a longer tour including a rainforest hike, orchard tour, and possibly a gourmet picnic lunch; your visit to the Kilohana Plantation is bound to be be both fun- and fact-filled. The 40-minute rail tour is $18/adults, $14 children 3-12, kids under 3 ride free. Tip: Call ahead to ask which days the cruise ships will be visiting to help avoid peak crowds here (1-808-254-RAIL). To see current schedules, visit their site at www.kauaiplantationrailway.com. The view from our living room lanai at Castle Kaha Lani. The visiting doves, cardinals, and other birds were also a highlight here! Kauai has a great mix of upscale family-friendly resorts (with water slides! ), vacation rental homes, and condos to choose from. For this post, I’m going to recommend the Castle Kaha Lani Resort condos, where we (and other friends of ours) have stayed. They are centrally located for reaching all of the activities I’ve recommended in this post, from north to south. A one-bedroom condo here will also give your family the convenience of a kitchen and more space to sprawl. And if you’re like us, you’ll especially enjoy carrying your coffee cups down to the small beach in the mornings while your jet-lagged kids make driftwood sculptures. The location, just north of Lihue (near Kapaa), is also helpful when the weather may be better on some parts of the island than others–it may be just a short drive from here to a sunnier or less windy day trip destination. You can see more photos from our stay and read the full review of Castle Kaha Lani here. Forget Frommer’s. You do not need a babysitter to enjoy an outdoor lunch at Gaylord’s. Tired of missing out on gourmet dining during vacations because you have energetic kids along for the ride? Then treat yourself to lunch at Gaylord’s during your Kauai family vacation. 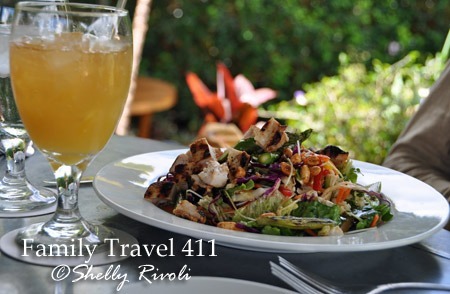 You can dine al fresco at the historic Kilohana Plantation house; oh, yes, you can. Enjoy your choice of savory crepes (roast chicken, brie, porcini mushrooms…). Or try beer-battered fish tacos, a Hawaiian-style grilled fresh catch, delectable salads and sandwiches…. All the while, your children practice galloping like horses back and forth, back and forth, across the sweeping lawn below the patio–while bothering no one. Lunch options range from the $5/$8 soup du jour to $18 entrées. Of course, there is also a children’s menu ($5 to $7 options) when they have worked up an appetite. What’s more, we appreciated the covered cups with straws and custom fruit plate created for our keiki. See the current menu and dining hours here on Gaylord’s official site. 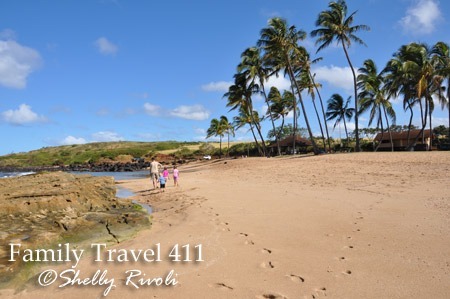 You can view these recommendations on my Google map of the 411 on Kauai with Kids. For more family-friendly Kauai recommendations, see my Kauai with Kids board on Pinterest. It’s so nice it doesn’t even look real! Thanks for the great information. Great suggestions. Making a note for what will hopefully be a future trip!